About Us - Baughman Memorial Works, Inc.
Nelson Howard Baughman moved to Dover in 1875. 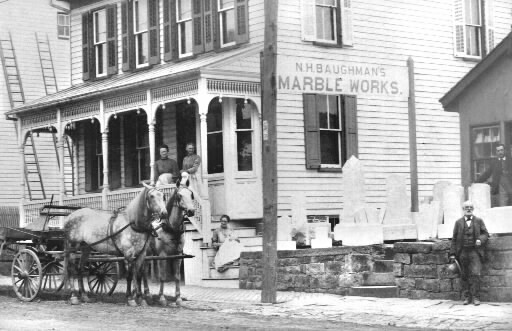 He founded Baughman Marble Works near the Dover square. He transported marble from York by a two-horse team. All designs and lettering were cut by hand using a mallet and chisel. Sandstones were usually used for bases. Nelson soon became known for his fine craftsmanship and honest nature. Through the years, interest continued in the business with younger generations. Nelson taught son Harry. Harry taught son Nelson Merle. Nelson’s son, Donald, also took an interest in the art of crafting memorials and oversaw the construction of a new shop in 1963. Today, Donald’s wife, Beverly, along with their oldest daughter, Sharon Baughman Witmer, and her husband, Warren Witmer, work side-by-side with him in the business, making the fifth continuous generation of memorial craftsmen. Through the years, the industry has changed with updated technology and more efficient ways of crafting memorials. However, the tradition of family values, honesty and integrity has continued with each generation.